The top American military officer here has proposed that South Korea buy a key U.S. underground command bunker on the outskirts of Seoul, as his troops will move to an area south of the Han River, relinquishing wartime operational control to Korean commanders, a source at the Combined Forces Command (CFC) said Sunday. CFC Commander Gen. Walter Sharp, who concurrently heads the 28,000-strong U.S. Forces Korea (USFK), made the proposal to South Korea during the Key Resolve command-post exercise that ended Thursday, the source told The Korea Times. The Ministry of National Defense is reviewing the offer but has yet to make a final decision, a ministry official said. The bunker, known as CP Tango (Command Post Theater, Air, Naval, Ground Operations), is the main command and control center from which U.S. military leaders would direct any combat against North Korea. Sharp's proposal reflects the firm U.S. intent to shift its roles and missions to air- and naval-centric support after the South Korean military takes over operational control of its troops during wartime in 2012 as scheduled, despite calls to delay the transition, the CFC source said. Conservatives in South Korea and some U.S. experts have argued the command transfer should be delayed not to weaken the U.S. security commitment on the Korean Peninsula amid the lingering threat posed by North Korea's missile and nuclear programs. Following the transition of the wartime command authority, the USFK wants South Korean troops to assume most theater operations against North Korea, while it would be more focused on regional threats in the long term, he said. ``Tango is the most important facility for the defense of South Korea because it would be the nerve center for U.S.-Korea operations, should a war with North Korea ever occur,'' the source said. The USFK would be then dependent on the Tactical Air Control Center (TACC) at Osan Air Base, Gyeonggi Province, for theater command-and-control operations, while establishing a new underground control center at Camp Humphreys in nearby Pyeongtaek, he said. After Seoul and Washington agreed on the transfer of wartime operational control in 2007, the USFK had asked South Korea to pay for the takeover or use of the bunker, the source said. 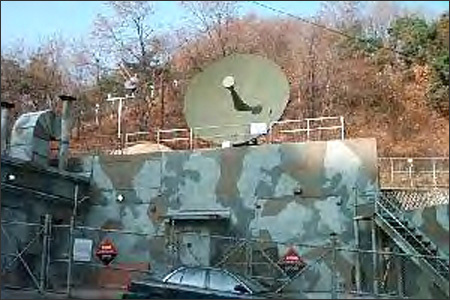 However, the Korean authorities had not been positive about the offer, arguing they could use the ``B-1'' command bunker in Seoul, should war break out. Tango was in the media spotlight in March 2005 when then U.S. Secretary of State Condoleeza Rice visited it during a regional tour. The granite bunker, which is estimated to cost at least 200-300 billion won, is reputed to be able to withstand even a nuclear blast as well as survive any biological and chemical attack. The center of about 30,000 square meters features up-to-date computer, information-gathering and communications equipment, according to CFC officials. The bunker has a war room where top military commanders can receive battlefield situations around the clock and hold video teleconferences through huge monitor screens and banks of computers, they said. Commanders in the war room could immediately detect any provocative move by the North, such as the test-firing of missiles, with the help of the Sensitive Compartmented Information Facility (SCIF) controlling information being received from U.S. satellites and spy planes, such as U-2s. SCIF could also allow U.S. military commanders to communicate with U.S. government officials from the Central Intelligence Agency, Defense Information Agency, National Security Agency, Department of Defense and the White House. 주한미군이 한국측에 핵심 전쟁지휘 지하벙커 시설을 판매 제의한 것으로 확인됐다. 이는 2012년 전시작전권 이양에 대한 논란이 지속되는 가운데 미국이 예정대로 평택기지이전과 전작권 전환을 통해서 주한미군의 전력을 해.공군 위주로 재편하겠다는 의지로 보인다. 한미연합사 소식통에 따르면 샤프 주한미군 사령관은 이와 같은 제안을 최근 키리졸브 훈련기간에 한국 당국자들에게 전했고, 국방부 측은 이를 신중히 검토하고 있지만 아직 결론을 내리지는 않은 것으로 전해졌다. 전작권 전환 이후 주한미군은 한국군이 대부분의 전구 작전을 수행하고 자신들은 장기적으로 지역내 분쟁에 대응하는 신속기동 대응군으로의 변모를 꾀하고 있다. 소식통은 “탱고(벙커)는 유사시 한-미 공동 작전의 뇌관 역할을 하는 시설로 한국 방위에 있어서 가장 중요한 시설”이라며 “따라서 탱고벙커를 한국에 이양한다는 것은 유상 혹은 무상제공 여부와 별도로 주한미군의 한반도에서의 역할 변화를 암시하는 큰 의미가 있다”고 말했다. 그는 “탱고를 한국에 이양한 후 주한미군은 오산공군기지에 위치한 TACC를 중심으로 한반도 전구 지휘통제를 수행 할 것이고, 새로 확장되는 평택 캠프 험프리에도 새로운 지휘 벙커가 만들어 질 것”이라고 밝혔다. 소식통에 따르면 지난 2007년 한미간 전작권 합의가 이루어진 후 주한미군은 지속적으로 한국이 탱고벙커를 유상 인수하거나 사용료를 지불할 것을 요구했던 것으로 알려졌다. 하지만 한국측은 서울지역에 있는 B-1벙커를 전쟁수행 지휘부로 사용할 수 있음을 강조하며 이에 부정적인 반응을 보여왔다. 한 관계자는 “한국측이 어떤 결정을 내릴지 모르겠지만 중요한 것은 탱고시설이 그냥 폐쇄하기엔 너무 좋은 시설이라는 것”이라고 말했다. 탱고시설은 지난 2005년 콘돌리자 라이스 당시 미 국무부 장관이 방문하면서 언론의 주목을 받은 바 있다. 연합사 관계자들에 따르면 화강암 재질로 만들어진 탱고벙커는 적어도 2-3천억 원 정도의 시설비가 들어갔으며 생화학 공격은 물론 핵 공격에도 견딜 수 있도록 견고하게 만들어 진 것으로 알려져 있다. 약 만평 가까이 되는 지하 벙커 내에는 최첨단 컴퓨터, 정보수집 및 통신장비들이 갖추어져 있다. 특히 `워 룸(war room)’으로 불리는 상황실에서는 지휘관들이 전장상황을 실시간 파악할 수 있으며 대형 모니터를 통해 화상 회의를 하며 작전 지휘가 가능토록 되어있다. 지휘관들은 SCIF라는 첨단 장비를 통해서 미 정찰위성이나 U-2정찰기 등에서 수집되는 정보를 분석해 북한의 미사일 발사와 같은 도발 징후를 거의 실시간 탐지, 확인할 수 있도록 돼 있다. 또한 미국의 중앙정보국 (CIA), 국방정보본부, 백악관 등과 정보교류가 가능하다.